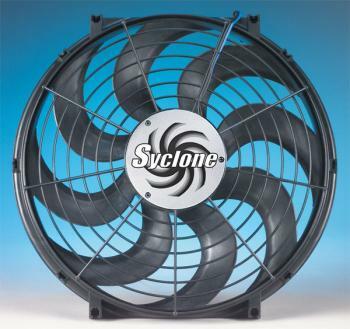 Flex-a-Lite Electric Fan - Syclone Series UNIVERSAL - Lightning Motorsports - Selling Speed since 1996 ! A Totally New Performance Engine Cooling Fan. The most efficient S-blade fan in the aftermarket. For primary or auxiliary cooling – Reversible; pusher or puller. *When used as a primary cooling fan, one of these electric units can save up to 17HP and recover 20 lb-ft of torque.